After all of last week’s bacon, beer and cake (and, of course, the unfortunate pants incident), I decided to declare this week the week of the vegetable. Hooray for veggies! And whole pairs of jeans! I recently came across this recipe, featuring cabbage (and not much else, actually – the recipe is supremely simple), and decided to try it on for size as Tuesday’s dinner. The result was so satisfying that I decided to re-declare this week as the week of the cabbage. Hooray for cabbage! 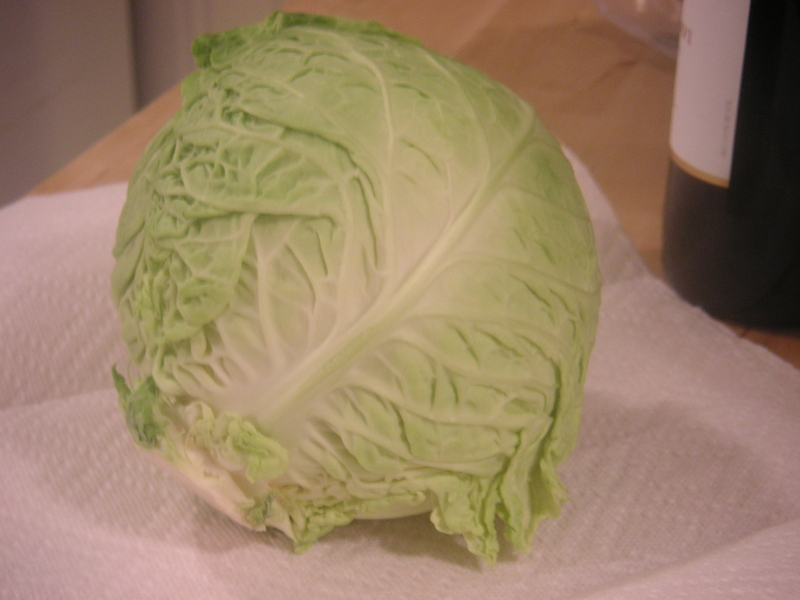 Cabbage is, in my opinion, a highly underrated and misunderstood vegetable. (Except in France, where ma petite chou – my little cabbage – is used as a term of endearment. Adorable, n’est pas? Those French are onto something.) Usually busy being smothered by mayonnaise in coleslaw or playing second fiddle to boiled corned beef, cabbage is crisp and leafy and downright delicious, and deserves to be cast as the leading lady every now and again, I say. So, on Tuesday night, cabbage was the Kate Winslet in the cast of components for my tasty dinner of cabbage with hot sauce. I used Savoy cabbage instead of green cabbage, and added a capful of toasted sesame oil to the soy sauce/hot sauce mix, because I was feeling fancy, that’s why. Savoy cabbage is often described as the king or queen of cabbage, mostly because it’s the sweetest, tenderest of its species. It’s also the belle of the cabbage patch ball – it has pretty, crinkly, puckered leaves instead of plain old smooth ones. Eating Savoy cabbage is kind of like putting on your Sunday best – your pretty, lace petticoat instead of your everyday taffeta. You know, if you’re Laura Ingalls Wilder. In keeping with cabbage week, Wednesday night’s dinner featured kale (which, incidentally, is in the cabbage family) with chickpeas, pancetta, and asiago cheese. Let me tell you something about kale. It seems sort of scary, what with all of its giant, husky, deep-green, curly-tipped leaves, but boy, that stuff is good. It’s wintery and fresh and satisfyingly crunchy, if you’re careful not to overcook it. Also, kale is a super food. I don’t mean it’s a super food in the sense of, like, “hey, that kale sure is swell.” I mean it’s a superfood, and should get a blue spandex suit of its own. Not only does kale contain certain cancer-fighting and cell-detoxification compounds, one cup of the stuff provides obscene amounts of vitamins A, K, C, E, fiber, calcium, potassium and iron, as well as over 25% of your recommended daily dose of manganese. * So, you know, that’s good. I bet if A-Rod had discovered the super powers behind this particular form of cabbage, he would have put down the steroids and started munching stalks of kale. Chase Utley…take note. I had a few helpings of this as a meal for dinner, but it would also make a great side dish for roast chicken or pork. If you’re eating it as a meal, this dish serves about 4. As a side dish, it could serve about 8. Preheat your broiler. In a deep pan or Dutch oven, sauté the pancetta over medium heat until crispy, then remove from the pan. Add the onions and garlic, and sweat until soft and translucent (if the pan seems too dry, add a splash of olive oil to get things going). Add the chickpeas, kale and chicken stock and simmer, letting the kale wilt slightly and the chickpeas get warm (add the kale in batches, if there doesn’t seem to be room enough in the pot). When the kale has softened up, add the lemon juice, salt and pepper, and let simmer until most of the liquid has reduced from the pan. If using a regular pan, transfer the kale mixture to a baking dish (the dish is going under the broiler, so you’ll want to make sure you use a pan or dish suited to withstand the heat – a Dutch oven or glass baking dish should be fine). Sprinkle the crisped pancetta on top of the kale mixture, and then top with the shredded cheeses. 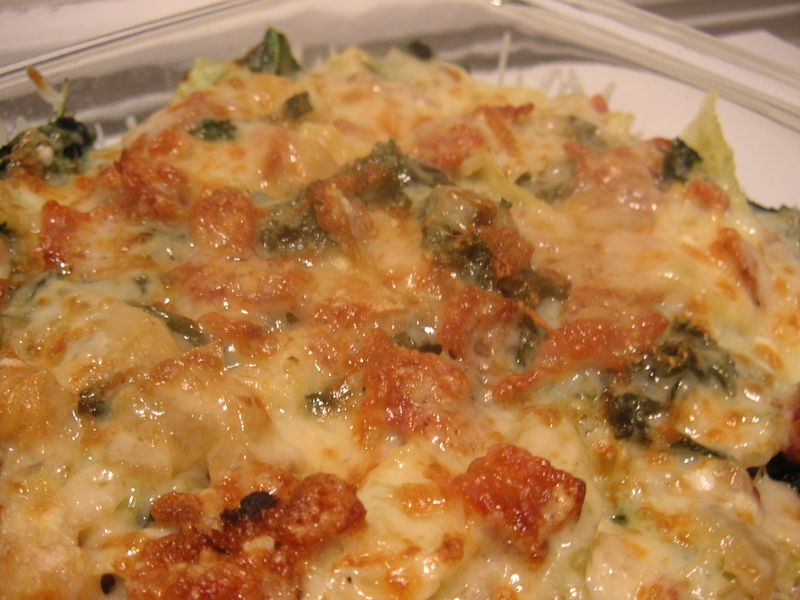 Place the dish under the broiler for 1-2 minutes, until the cheese is brown and bubbly. Serve immediately. *Thanks, World’s Healthiest Foods website (whfoods.com). Big ups to kale. Totally underrated. Timberlakes in Washington, D.C. used to do a great thing with kale as a side dish to their delicious BBQ ribs. But you’ve taken the kale product to a whole new level. Nice!